While it may look different than the classic martini cocktail, it tastes virtually the same… except it is green. My neighbor had one for St Patty’s Day...the day after! This drink also shows up as a great choice to celebrate the rite of spring! 1. Fill the martini shaker with cracked ice. 2. Pour two parts vodka into the shaker. 3. Add a drop – only a drop- of dry vermouth. 4. Cap the shaker and shake vigorously until well mixed. 5. Pour the martini into an awaiting martini glass. 6. Add a drop of green food coloring to the drink. 7. 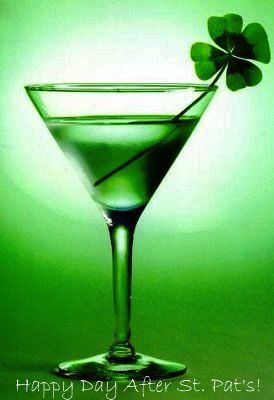 Stir the martini until the color becomes a nice emerald green and serve to the guests.